Do you ever pay attention to the highway median when you’re on a long road trip? The space between a divided road and the few feet of no-man’s-land just beyond the blacktop have intrigued me since reading A Sand County Almanac in college. I’ve lost my copy but, if memory serves, Aldo Leopold sees in these forgotten strips of dirt the remnants of the way things used to be. These useless pieces of land contain glimpses of the great prairies that originally covered much of the Midwest, land that was long ago plowed under for wheat, soybeans, and Walmarts. By examining the highway’s margins we discover the land as it was before we remade it for our purposes. Leopold’s observations about the marginal prairie have come to mind as I prepare to preach about Sabbath-keeping. Sabbath is that ancient practice of stopping weekly to rest after the pattern of a God who rested and was refreshed on creation’s seventh day. I wonder if a weekly rest is similar to the prairie grasses, flowers and bugs that cling to the sides of highways. A Sabbath rest allows the margin to remember the way life was meant to be lived. How it was in the beginning. Six days shall you travel the highway, making progress and watching the scenery pass, but on the seventh day stop and notice the prairie. Remember what was true and is still true. 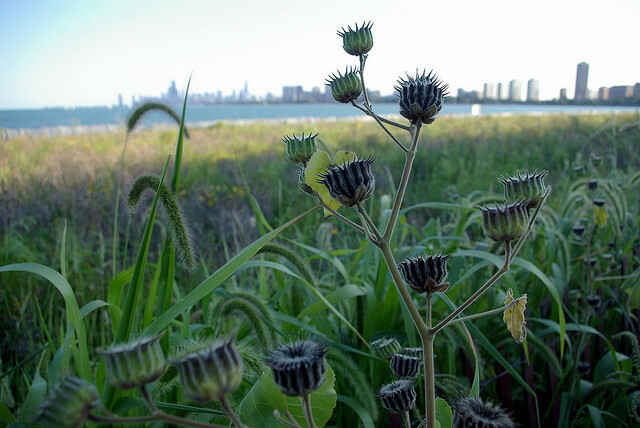 A couple miles north of our home, along Lake Shore Drive, the city has planted a native prairie. The tall grasses and subtle flowers stand out from carefully cut lawns and park benches. Prairie is being reintroduced, integrated into the modern landscape. I wonder if the analogy holds together. Does a weekly Sabbath spread from it’s once-a-week practice to a posture that carries throughout the week? In his Diary of Private Prayer John Baillie offers the following petition for Sunday evenings. Grant, O heavenly Father, that the spiritual refreshment I have this day enjoyed may not be left behind and forgotten as tomorrow I return to the cycle of common tasks. Here is a fountain of inward strength. Here is a purifying wind that must blow through all my business and all my pleasures. Here is light to enlighten my road. A light to enlighten my road and strips of prairie to renew my trust in the God who was, who is, and who is to come. Next Post What would you say at 8th grade commencement? I love readng what you share about your meditation, and words about the Christian life. I’m thankful to have you as a grandson! And for God’s faithfulness in revealing His truths to you. Thank you very much Grandma!